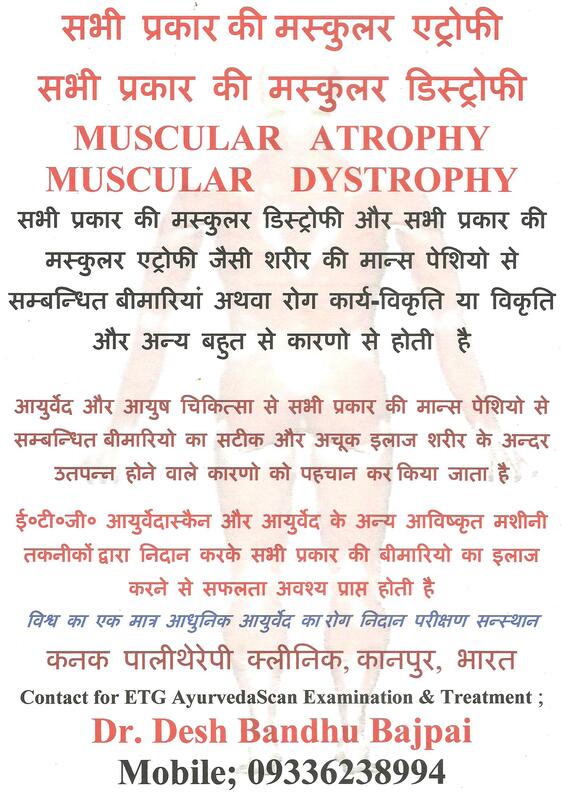 MUSCULAR DYSTROPHY OR MUSCULAR diseases and related disorders are totally curable / relivable by Ayurveda and Ayush therapies treatment and management. Muscular Dystrophy is mainly caused by few reasons. Collection of Fat or deposition of extra cellular fluid or muscular tissues incorrect functions or appearance of any kind of pathophysiology and others reasons are the cause of disease condition. These are the few causes of disorders. Every age can be affected with this disorder. As a result muscles, particularly of lower limbs and upper limbs are affected much more. Normal shape of Muscles increases in shape and becomes tough swelled. Due to toughness of muscles, movement inhibits and muscles natural working capacity like relaxation and contractions and flexations are affected. Know more about the disease condition in this video cast by Dr Desh Bandhu Bajpai. By virtue of latest Ayurveda diagnosis systems “” ETG AyurvedaScan “”, it is now possible to find out the genesis of the any disease problem inside the body. The Ayurveda Blood examination and AYURVEDA Urine examination provides opportunity to analyse and sythesise blood chemistry anomalies inside the body. Concluding the problem and diagnosis, appropriate and suitable Ayurveda and Homoeopathy and Unani remedies along with the suggestions of changing food habits and life style assures to meet the cure to the sick person’s condition. Kindly see our videos and make a regular visit to our channel for new information oriented videos on AYURVEDA AND HOMOEOPATHY AND UNANI AND YOGA AND NATURE CURE AND SIDHDHA along with the latest medical scineces innovations and our research centers activities. If you want any special informative videos on any medical subjects kindly inform us.